It looks like BlackBerry users are in for a nice surprise, especially those on AT&T. Some documents have been leaked, suggesting that four handsets are to be released by the carrier. Unfortunately, there is no information on the exact dates, but we guess (hope) it is by the end of the year. 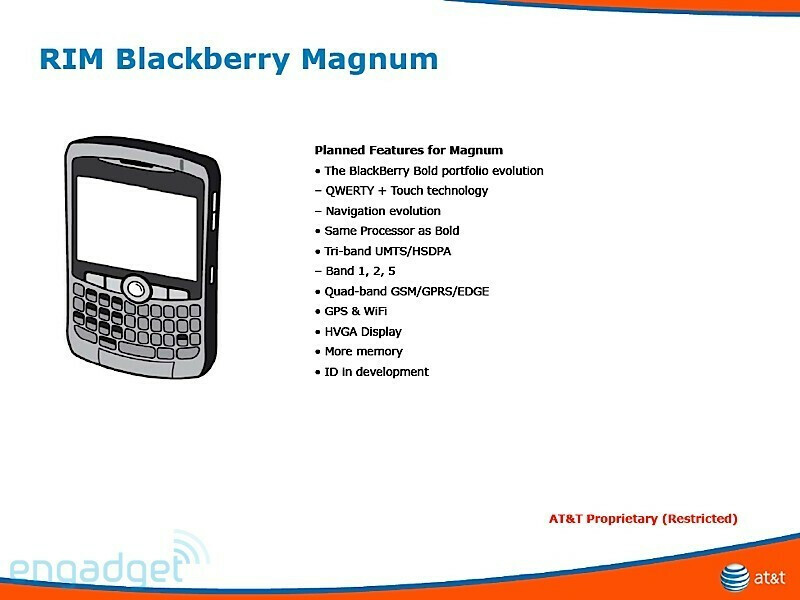 First off, we have the BlackBerry Magnum, which is interestingly referred to as “The BlackBerry Bold portfolio revolution”. What’s so cool about it is that it actually throws a touch-sensitive screen into the deal. Hooray! The phone itself is expected to resemble the Bold almost totally in all aspects. Next up, we have the Onyx. 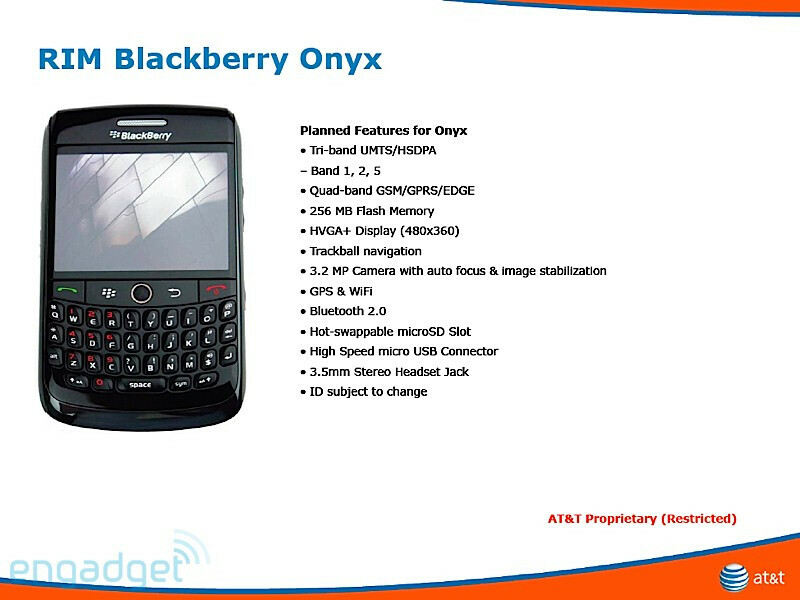 Well, the Onyx should come as a refreshment of the Bold, with a (hopefully) better 3.2MP camera and a smaller body. Of course, there will be a little something for budget-cautious users too. The BlackBerry Gemini is believed to be the replacement of the Curve series, offering a new optical trackball and a 512MHz+ processor. 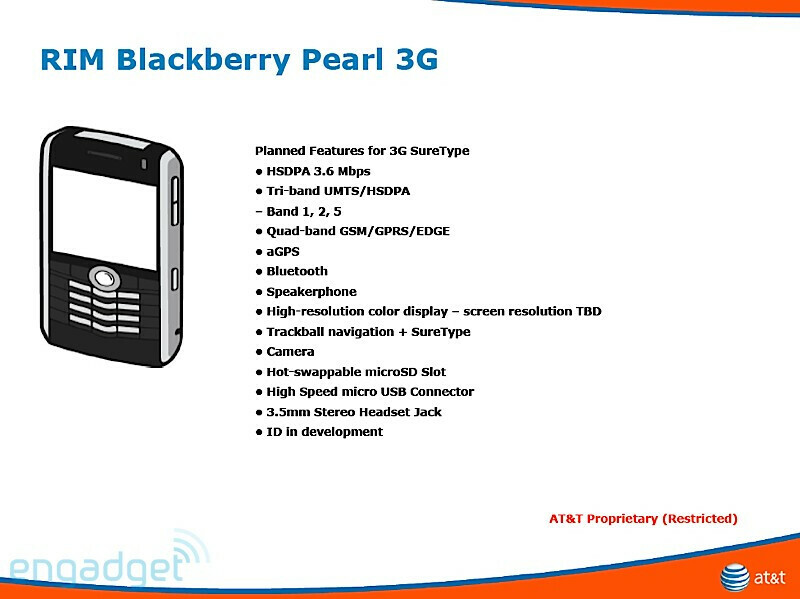 There is yet another affordable solution coming to AT&T, the Pearl 3G. We presume it will have a slightly renewed look, compared to the original Pearl and as it is said, utilize a tri-band UMTS/HSDPA 3.6Mbp connectivity. Check the screenshots for some specs. 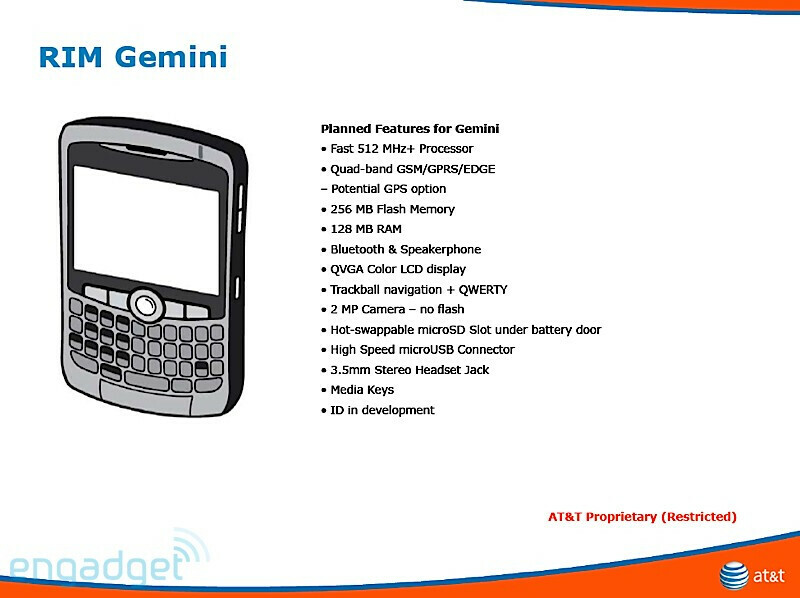 The Gemini is a quad band GSM phone. haha lol..so your the one that gives people -1's!!! Razr with an actual Razor FTW!!!! !